In the fallout after my renunciation, some people have asked me a big question. If it causes so much strife, why do you write? Yes, I’m currently making less than a living wage. Yes, I do most of my marketing and publicity on my own. No, I don’t have a screenplay offer or juicy book contract…yet. Yes, I've alienated a good portion of my family. Writing a novel is an arduous process that takes months with no guarantee of a pay off. Any writer out there knows the simple answer. I’m compelled to put my thoughts on paper. My head is filled with observations, voices, and stories. The only time I’m settled is when I can effectively get the noise onto the white space of the page. I’ve been inundated with good will and support of people who know me. 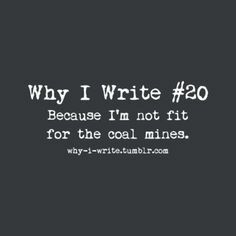 Several affirmations and articles about the struggles of the writer have popped up on my FB feed. One, in particular, was an NPR interview with Jonathan Franzen, author of The Corrections. In it, he says, “I’m in the business of betraying secrets about myself.” That’s the rub for writers. Even if we only write fiction, our life seeps into our work. I generally limit my creative nonfiction to essays or short stories, and of course, my blog. I try to convey humor in my pieces. Even the most heart wrenching moments have flashes of the ridiculous in them. If I had a boring family I’m not sure if I would have ever become a writer. 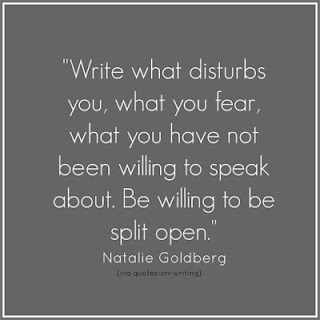 I don’t have to tell you writing to split open isn’t for the faint of heart. Franzen said writing takes him outside of himself. Writing about my family draws me inward. Putting my life into words brings my thoughts and my feelings into clearer perspective. Even in my fiction, it’s unavoidable, pieces of me creep into the lines on the page. Being a writer means I’m an observer. I’m the person eavesdropping at the coffee shop or the nail salon. I’m the person who asks too many questions. I’m driven to know the why of things and people. No one’s story is boring to me. I’m willing to turn that close observation on my own baggage. I don’t write to skewer anyone. In my experience, people are very good at self-flagellation with little impetus. This is especially true of folks who are quick to see the flaws in others. Their assumption is that everyone must think the way they do and therefore they read for the worst. Like most artists, writers are subject to the urge to describe the world around us. It’s not a mild impulse either. Sometimes it’s do or die. Okay, not die but the noise can crowd everything else out impacting our lives. Just ask my teenagers. I'm certain on the days I'm in the zone they believe they'll starve. They'll be fine. I have the pizza joint on speed dial. And they're old enough to toss a load of clothes into the wash.